Glenbuchat Old Kirk was established in 1473 but is no longer in use except for an annual service. From History of Logie-Coldstone and Braes of Cromar the full dramatic story its establishment can be found. “An event now (1649 A.D.) occurred that very intimately concerned the parish of Logic. " Glenbucket was of old a chapelry of the Church of Logy in Mar. It was erected into a parish in the year 1473 A.D. by Bishop Thomas Spens, with consent of the Dean and Chapter of the Cathedral and of Sir Edward Makdowel, Vicar of Logy. And that completes the Deochry throng. "Bellman Beattie" - A bellman was the man who rang the church bell calling the people to worship. Presumably this would have referred to John Beattie, Jr.
John Beattie Deochry Born - 1792/3 Strathdon [per 1851 census]. "1836 - Beattie - John Beattie Dochry had a child born 7th August, baptized, & named John (Jnr) before witnesses"
The Church is supported by the Society Of the Friends of The Old kirk of Glenbuchat. c:the collection of money for the foregoing. It is the north side and some of the gables that remain from the 1629 rebuild with the south wall being mostly 18th century. At the apex of the west gable there is a stone bearing the date 1629 and the initials of Andrew Kerr the minister at that time. The two gable windows belong to the late 18th century while those on the south side are older and have been recycled from another building. cracks. These minor points need to be inspected regularly. Date stone initialled with M.A.K. reputed to be the initials of Minister Andrew Kerr. The E. gable is crowned by a large bellcote complete with an unusual large urn finial. The S. façade is symmetrically arranged with two windows and two doors allowing the internal arrangement of the kirk to function, having a centrally-placed pulpit. there are a few loose slates on the roof and tree branches overhang the N. side of the kirk, could cause concern in later years. elements to great effect. The overall design of the kirk is of great importance as it illustrates the transition from medieval to prototypical 18th - century ecclesiastical architecture. from the early 19th -century. The twin tablet Reid memorial, to the rear of the kirk, needs to be taken down and rebuilt otherwise it will fall over and the stones will break. Conservation Digest : Urgent details. can be observed through the windows. The yard is well maintained though the recumbent stones would benefit from being lightly brushed. There are several sections of the boundary wall that are cracked and will eventually need to be tied together or rebuilt. ideals of the pre-18th - century kirk with that ofthe 18th - century form. There is no provision for parking cars. 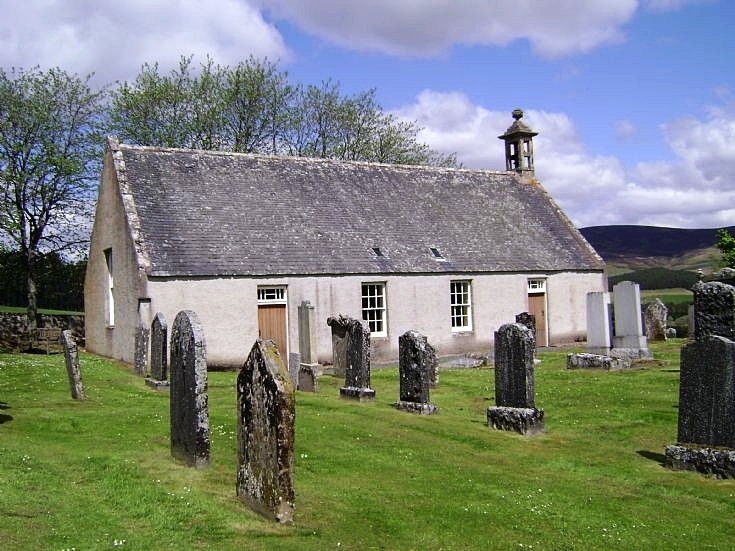 The parish church of Glenbuchat, date unknown, but probably built at the same time as the manse in 1775, is supposed to stand on the foundations of an older church. The dedication or date of the older structure is not known but a stone inscribed 1629 is built into the W gable of the present church. The first church in Glenbuchat was founded in 1473 and dedicated to St Peter. It was erected at Capeltone, almost certainly the present Kirkton. The present church, rebuilt in 1629 and again in the 18th century, probably stands on the site of the original church and may even incorporate parts of its fabric. The present 18th century church is harled and bears no trace of an earlier structure save for the date-stone built into the W gable. The parish church of Glenbuchat is situated on a moderate NE-facing slope at an altitude of 305m OD, and may occupy the site of the 15th century church of St Peter. The original church was founded 1473 at Capeltone, almost certainly the present Kirkton. The present church was rebuilt in 1629 and again in the 18th century, and may even incorporate parts of its fabric; it is dated 'M.A.K. (Minister Andrew Keir) 1629) at the apex of the W gable. Some of the stones within the rubble-walled enclosure date from 1686 but most are more recent; the church was in course of restoration by the county council in 1964. Parish Kirk, 17th century. Reposing in its own kirkton, this harled rectangle has an urn-crowned bellcote on the east gable and a panel inscribed M.A.K. [Minister Andrew Kerr] 1629 high on the west gable. Simple square-headed windows with clear lights suggest another plain Scots kirk, but the orthodox interior (pulpit with sounding board on south wall, box pews) is enlivened by an eastern gallery with square marbled centre column and the arms of the Duff family. Pleasing clutter of stones from 1686 in the kirkyard, adjacent to the solid manse of c.1785 and later. I believe there is a family service/picnic on the 3rd Sunday in August, can anyone confirm this please?